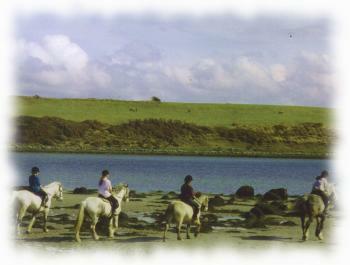 Family run Riding Centre set in gently rolling pastureland fronting onto a sheltered inlet of Galway Bay. Located on fifty acres of ground on the main scenic route to Connemara, the Riding Centre has become a haven for both young and older enthusiasts alike. The attractive centre stables 18 horses of various sizes and standards and caters for most requirements. 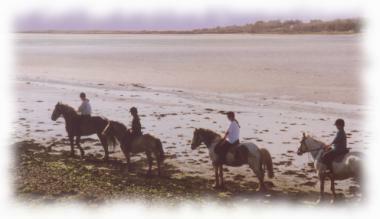 Trail rides for one or two hours through this scenic and beautiful region can be arranged. Whilst enjoying the scenery including spectacular views of the Clare Hills across the Bay, you are having a fun time. A gentle form of relaxation for both the tired business person or the jetlagged tourist is ensured by a visit to the Rusheen Riding Centre. Helen Joyce and her superb staff are excellent instructors, and young teenagers are particuarly encouraged to avail of the facility. 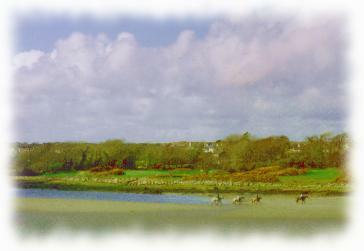 15 minute walk to Silverstrand and Barna Woods. Designed and hosted by World Wide Web Marketing Ltd.